Fruit Biscuits from Karachi Bakery situated at Hyderabad are one of our family favorites. These biscuits are unique in taste and flavor. They just melt in your mouth and are truly addictive. Since these goodies are not available for us here in Australia, we always had missed them. Ever since I started my baking journey, I was trying to replicate the taste of these fruit biscuits. After some experiments and guess works, finally I got it perfect! Take the sugar and make a fine powder in a mixie. Alternatively, you can use the caster sugar available in stores. Beat the butter in a mixing bowl till creamy. I have used the electric beater to ease this process. Add the powdered sugar in 2 - 3 batches to the butter. Continue beating till the mixture is fluffy and creamy. Now, add the vanilla essence and rose water and mix gently. 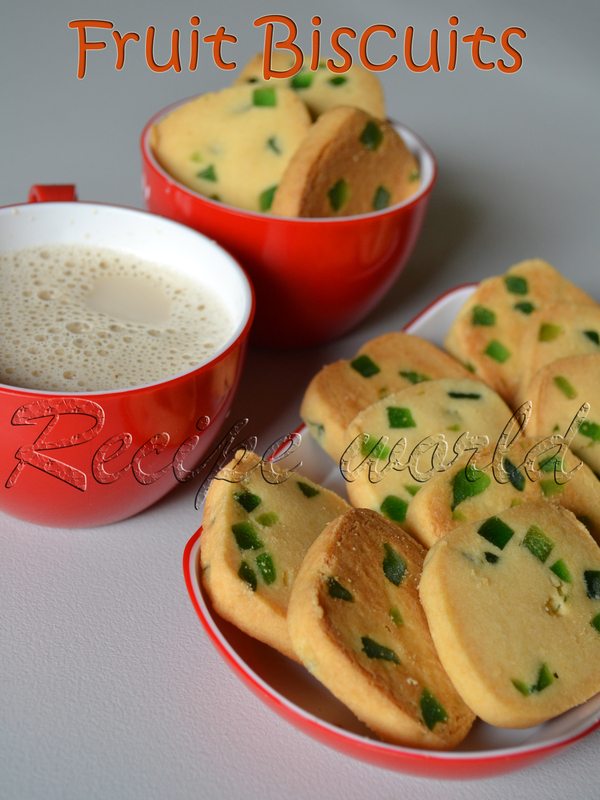 Pour in the custard powder and milk powder and mix it nicely. Add the all purpose flour in small batches and keep mixing till you get a soft, non - sticky dough. If needed, you can add little more extra flour than mentioned above, absolutely no probs! Finally, add the tutti frutti and mix it nicely. Divide the dough into two equal parts. Take each part of dough, and make it into the shape of a log or as you like. Wrap it in a butter paper and keep refrigerated for 30 minutes or more. Pre heat the oven to 175°C. Line the baking tray with butter paper. Take out the dough from the refrigerator. 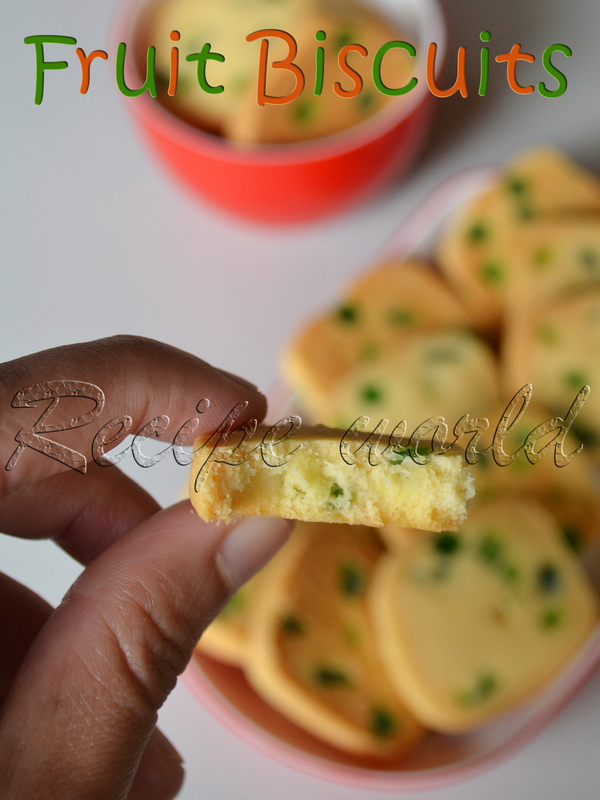 Cut them into slices of 1 cm width. Arrange them on the lined baking tray. Leave some space in between for the biscuits to expand. Bake them for 20 minutes or till done. 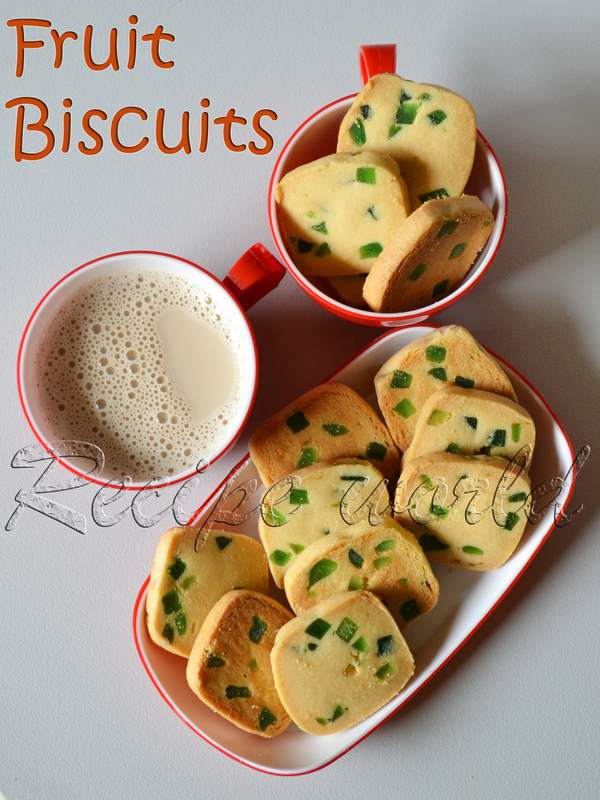 Enjoy the delicious biscuits with a cup of tea or just like that! You can keep the dough refrigerated even for more than 30 minutes. For me, it took 5 minutes more to bake when I kept the dough in the refrigerator for 1 1/2 hours. Thanks Radha..will be happy to hear your feedback! They turned perfect and delicious.. I'm a big fan of Karachi biscuits too, and these ones look just perfect. Pinning the recipe to my Pinterest board, will make them asap. I'll let you know how they turn out.